MR images show an acute hematoma in the left frontal region. Axial T1-weighted (T1W) and T2-weighted (T2W) images show hypointensity due to the hematoma. A small rim of vasogenic edema surrounds the hematoma seen on T2W imaging. Courtesy Dr Nikhil Unune, MBBS, DMRD, consultant radiologist, Satara, Maharashtra, India. Hemorrhages of various ages are seen in the left cerebellar hemisphere with blood-fluid levels in a patient on anticoagulation therapy for chronic venous sinus thrombosis. The hematoma is seen as a mixed signal on T2- and T1-weighted MRI with marked susceptibility on gradient-echo (GRE) imaging. Intracranial hemorrhage (ICH) is a common cause of acute neurologic emergency. Pathologic accumulation of blood in the cranial vault (ie, ICH) may occur in the brain parenchyma or the surrounding meningeal spaces. Such accumulations can be epidural hematomas (EDHs), subdural hematomas (SDHs), subarachnoid hemorrhages (SAHs), or intraventricular hemorrhages (IVHs). The etiology of ICH is multifactorial and varies with a person's age and predisposing factors. Subacute subdural hematoma in a right frontoparietal concavity. CT scan (CT) shows an isoattenuating-to-hypoattenuating subdural hematoma. Both T1-weighted (T1W) and T2-weighted (T2W) MR images show high signal intensity suggestive of a late subacute hemorrhage. To differentiate between intracranial atherosclerotic plaque, vasculitis, reversible cerebral vasoconstriction syndrome, arterial dissection, and other causes of intracranial arterial narrowing. To determine the location of atherosclerotic plaque relative to branch artery ostia, to diagnose stroke etiology, and to assess risk of angioplasty. To predict future behavior of unruptured intracranial saccular aneurysms. To identify symptomatic, nonstenotic disease of the intracranial arteries. To assess atherosclerotic plaque activity. To select an intracranial target for biopsy in suspected CNS vasculitis. To determine which aneurysm has ruptured in patients with acute subarachnoid hemorrhage and multiple aneurysms. Five distinct stages of hemorrhage can be defined (see Table 1, below). Iron can be either diamagnetic or paramagnetic, depending on the state of its outer-orbital electrons. In the paramagnetic state, iron alters the T1 and T2 relaxation times of water protons as a result of magnetic dipole-dipole interaction and susceptibility effects. This dipole-dipole interaction shortens both T1 and T2 relaxation times, with a greater effect on T1 than on T2. Table 2 (see below) summarizes electronic and magnetic properties of relevant substances of MRI in ICH. MR images show early subacute hematoma in the left occipital region. The lesion is seen as hyperintensity on T1WI and hypointense on T2WI with marked susceptibility due to hematoma on gradient-echo (GRE) imaging. The intraventricular hematoma also is well visualized as low signal on GRE imaging. MR images show late subacute hemorrhage in both thalamic regions in a patient with known cerebral malaria. T1-weighted, T2-weighted, and gradient-echo (GRE) images all show a hyperintense hematoma. Both T2W and GRE images show a hypointense rim due to hemosiderin. MR imaging shows a late subacute to chronic hematoma as a space-occupying lesion in the right posterior fossa. The hematoma shows a large medial subacute component and a small lateral chronic component. The chronic component (arrow) is hypointense on both T1-weighted and T2-weighted imaging. This hypointensity is enhanced due to the blooming effect of blood on the gradient-echo (GRE) image. The acute phase begins after a few hours and is characterized by the formation of deoxyhemoglobin. This process first occurs in the periphery and then affects the center. The iron atom in deoxyhemoglobin has 5 unpaired electrons; hence, it is paramagnetic. The magnetic susceptibility of deoxyhemoglobin is different for intracellular and extracellular locations. Acute hematoma contains intracellular deoxyhemoglobin and appears markedly hypointense on T2-weighted MRI images. At high-field strengths, T2-weighted images—and especially gradient-echo images—depict marked hypointensity. During the acute phase, the clot retracts, increasing the hematocrit and surrounding edema, which appears as a hyperintense perilesional rim on T2-weighted MRI. The increased hematocrit causes a parallel increase in T1 and T2 relaxation times. The early subacute phase begins after 2-7 days. An inflammatory cell response can be observed in the surrounding tissues. Macrophages invade the boundary of the hematoma to clear extravasated material and damaged tissue. When low oxygen tension continues, the amount of reducing substances declines. This change causes a failure in RBC metabolism, and iron atoms are oxidized to the ferric state. The result is the formation of methemoglobin and, thus, exposure of the iron atoms to water protons. This pattern decreases the T1 relaxation time and leads to marked hyperintensity on T1-weighted MRI. Over several days to weeks, the energy status of the RBC declines, causing a loss of cellular integrity, and the cells lyse. This event marks the beginning of the late subacute phase. As the loss of RBC integrity removes the paramagnetic aggregation responsible for susceptibility-induced T2 relaxation, T2 shortening disappears. Over months, the hematoma enters the chronic phase. As methemoglobin is broken down into small degradation products, its shortening effects are lost. The degree of hyperintensity on T1- and T2-weighted images lessens as the concentration of methemoglobin decreases with protein breakdown. The center of the hematoma may evolve into a fluid-filled cavity with signal intensity characteristics identical to those of CSF. In addition, the walls of the cavity may collapse, leaving a thin slit. Table 3 (see below) summarizes the evolution of intraparenchymal hematoma. Because the dura is well vascularized and because oxygen tension remains high, progression from one stage to another is slower in the lesion than in the brain. The first 4 stages are the same as those for parenchymal hematoma, with the same T1 and T2 characteristics. The chronic stage is characterized by continued oxidative denaturation of methemoglobin, which leads to the formation of nonparamagnetic hemochromates. Also, no hemosiderin rim is seen in the surrounding hematoma and no tissue macrophages are present. When recurrent bleeding occurs in SDH, separate events can be distinguished by different signal intensities on MRI. MR imaging shows subarachnoid hemorrhage (SAH). SAH appears hyperintense on the T2-weighted and fluid-attenuated inversion recovery (FLAIR) images and isointense to hypointense on the T1-weighted (T1W) image. Marked blooming is observed on the gradient-echo (GRE) image. Findings in the right parietal region extend into cortical sulci and suggest hyperacute or acute hemorrhage. The subarachnoid hemorrhage appears hyperintense on a T2W image, appears hypointense on fluid-attenuated inversion recovery (FLAIR), and shows marked blooming on a gradient-echo (GRE) image in the sylvian fissures, in the basal cisterns, and along the cerebellar folia due to blood. These findings suggest chronic subarachnoid hemorrhage and/or superficial siderosis. The pituitary macroadenoma appears as an isointense space-occupying lesion on T1W and T2W images, with blooming on the GRE image in the suprasellar region. MRI images show an extensive subarachnoid hemorrhage along the right cerebral convexity, most prominently in the frontal region. Also depicted are edema in the underlying cerebral parenchyma, mass effect, and compression of the right lateral ventricle. The hemorrhage appears hyperintense on T1-weighted images, with low signal on T2-weighted images and blooming on gradient-echo (GRE) images. The vasogenic edema appears hyperintense on T2-weighted and GRE images. Time-of-flight MR angiogram (MRA) shows a partially thrombotic aneurysm at the right trifurcation of the middle cerebral artery. These features suggest rupture of the aneurysm. Immediately after SAH, T1 slightly decreases. This change reflects the increase in the hydration layer due to the elevated protein content of the bloody CSF. This process subtly increases signal intensity in the CSF on T1-weighted images. [22, 21, 3] As in vitro studies have shown, substantial quantities of methemoglobin do not form until several days after hemorrhage has occurred. Several days to a week after the episode, signal intensity increases in the subarachnoid space due to methemoglobin formation. A short-T2 appearance is observed with an SAH or IVH when massive bleeding occurs. In this case, a fluid-fluid level or a subarachnoid or intraventricular thrombus may be present. [22, 3] In chronic and repeated SAH, hemosiderin may stain the leptomeninges, leading to a short-T2 appearance known as superficial siderosis. Magnetic resonance angiography (MRA) may be useful in the evaluation of aneurysms and other vascular lesions that cause SAH. Factors that limit the utility of MRI in the diagnosis of acute SAH are its low sensitivity for aneurysms less than 5 mm, its inability to depict small aneurysm contour irregularities, and its difficulty in providing high-quality images in patients who are agitated or confused. MRI, CTA, and angiography may be adequate for identifying and characterizing lesions to enable early surgery to manage ruptured intracranial aneurysms without a need for intra-arterial digital subtraction angiography in the acute phase of the illness. Primary IVH is rare. It is associated with hypertension, rupture of an aneurysm in the anterior communicating artery, anticoagulation, vascular malformation, moyamoya disease, and intraventricular tumors. Hypertensive hemorrhage is the most common cause of intracranial hemorrhage (ICH). Hypertensive hemorrhage leads to degenerative cerebral microangiopathy characterized by hyalinization of the walls of small arteries and arterioles and, ultimately, fibrinoid necrosis. Because of hypertension, ICH most commonly involves the lenticulostriate arterial branches of the middle cerebral artery, leading to putaminal or caudate hemorrhage. It may also result from rupture of the small perforating branches, in which case it leads to pontine or thalamic bleeds. Large hematomas often dissect into the ventricles, causing intraventricular extension. Blood from a ruptured saccular aneurysm enters the subarachnoid space. If it is under great pressure, it occasionally dissects into the brain parenchyma. The locations most commonly involved are the medial frontal lobe adjacent to a ruptured anterior communicating artery or anterior communicating artery or an aneurysm of the anterior cerebral artery and the temporal lobes adjacent to a ruptured aneurysm of the middle cerebral artery. Vascular malformations, such as arteriovenous malformations (AVMs), arteriovenous dural fistulae, and cavernous malformations, can manifest with brain hemorrhage. Both venous angiomas and capillary telangiectasias are generally benign lesions and generally not associated with hemorrhage. Catheter angiography is often needed to further evaluate AVMs and arteriovenous dural fistula. On MRI, AVM appears as a tightly packed honeycomb of flow voids caused by high-velocity signal loss. Areas of increased signal intensity may be due to slow or turbulent flow or thrombosis. Also seen are areas of hemorrhages in different stages. Cavernous hemangiomas have a typical popcorn-like pattern with a well-delineated complex and reticulated core of mixed signal intensity due to hemorrhage in different phases. Multiple lesions at different locations are seen in 50% of patients with cavernous hemangiomas. Developmental venous anomalies, formerly known as venous angiomas, appear as a stellate tangle of venous tributaries that drain into a large, sharply delineated vein, which often shows high-velocity signal loss. Contusions frequently occur in the basal anterior frontal and temporal lobes where the brain is adjacent to the bony floor of the anterior and middle cranial fossae. They may be seen in the cortex ipsilateral or contralateral to the side of injury. Contusions can be multiple, and they may be associated with other evidence of trauma, such as skull fracture, subdural hematoma (SDH), epidural hematoma (EDH), or subgaleal hematoma. Brain tumors may be associated with significant neovascularity, breakdown of the blood-brain barrier, and an increased risk for hemorrhage. High-grade tumors such as glioblastoma multiforme, and certain metastases (eg, melanoma, renal cell carcinoma, thyroid carcinoma, choriocarcinoma) are more likely to bleed than others. Metastases from lung cancer can also bleed. MRI appearances are often atypical and complex because blood of differing ages may be present and admixed with abnormal neoplastic tissue. The evolution of changes in MRI signal intensity is often delayed. Vasogenic edema is greater with brain tumors than with primary ICH, and it persists even into the chronic phase of hematoma. Administration of gadolinium-based contrast medium may reveal tumor enhancement. Cerebral amyloid angiopathy (CAA) is caused by the deposition of beta-amyloid in the arterial media and/or adventitia of small arteries and arterioles in the meninges, cortex, and cerebellum. CAA often causes hemorrhage in the cortex or in the subcortical white matter of the cerebrum or, in rare instances, the cerebellum. Dissection into the subarachnoid space is common, whereas ventricular extension is uncommon. In elderly patients, lobar ICH and multiple microbleeds are highly suggestive of CAA. Other causes of ICH are vasculitis, moyamoya disease, anticoagulation therapy, and coagulopathies. MRA is potentially useful for identifying secondary causes of hemorrhage, such as saccular aneurysm or vascular malformation, which may require urgent intervention. The sensitivity of MRA is good for medium-sized vessels but not as good for those distal to the circle of Willis. 3T MRA may be quite useful in this regard. CTA is also quite useful. Direct signs of dural sinus thrombosis on magnetic resonance venography (MRV) include absence of the typical high-flow signal intensity from a sinus that does not appear aplastic or hypoplastic on single sections from MRA and the frayed appearance of the flow signal from a sinus after recanalization. Indirect signs of dural sinus thrombosis include evidence of the formation of collaterals, unusually prominent flow signal from the deep medullary veins, cerebral hemorrhage, visualization of emissary veins, and signs of increased intracranial pressure. On MRI, hemorrhage is occasionally confused with other pathologies or conditions that cause hyperintensity on T1-weighted images. Examples are lesions containing fat, protein, calcification, and melanin. On T1-weighted images, melanotic metastases have hyperintensity similar to that of intracellular and extracellular methemoglobin. However, metastases from melanoma less commonly display susceptibility on gradient recalled-echo images, and they typically show some contrast enhancement. Lesions containing fat, such as lipomas or dermoids, are also hyperintense on T1-weighted images. Fat appears hypointense on conventional spin-echo T2-weighted images and hyperintense on turbo fast spin-echo T2-weighted images. Use of fat-suppression techniques, such as chemical shift imaging or inversion recovery sequences (eg, short-tau inversion recovery [STIR]) can help differentiate fat from hemorrhage. The presence of a chemical shift artifact may also indicate a fatty lesion. Hemorrhagic metastases usually show intense contrast enhancement, which is not seen in bland hematomas. Calcification may mimic hemorrhage, as both result in profound hypointensity on gradient-echo images. However, differences in the morphology and location of the abnormal signal intensity and in the clinical presentation suffice to distinguish the two. CT may also help differentiate these entities. Finally, the presence of residual gadolinium-based contrast material can mimic hemorrhage. As hemorrhage evolves, it passes through 5 well-defined and easily identified stages, as seen on MRI. Knowledge of these stages may be useful for dating a single hemorrhagic event or for ascertaining if multiple hemorrhagic events occurred at different times. Although CT may be more useful than MRI for detecting hyperacute parenchymal hemorrhage or early subarachnoid hemorrhage (SAH) or intraventricular hemorrhage (IVH), MRI is certainly more sensitive after 12-24 hours. MRI is also more specific than CT in determining the age of a hemorrhage. Both T1- and T2-weighted MRIs should be obtained to adequately characterize and stage a hemorrhage. Bradley WG. Hemorrhage and brain iron. Magnetic Resonance Imaging. 2nd ed. St Louis, Mo: Mosby; 1992. Wintermark M, Maeder P, Reichhart M, et al. MR pattern of hyperacute cerebral hemorrhage. J Magn Reson Imaging. 2002 Jun. 15(6):705-9. [Medline]. Korbakis G, Prabhakaran S, John S, Garg R, Conners JJ, Bleck TP, et al. MRI Detection of Cerebral Infarction in Subarachnoid Hemorrhage. Neurocrit Care. 2016 Jun. 24 (3):428-35. [Medline]. Lanzman B, Heit JJ. Advanced MRI Measures of Cerebral Perfusion and Their Clinical Applications. Top Magn Reson Imaging. 2017 Apr. 26 (2):83-90. [Medline]. Fink KR, Fink JR. Imaging of brain metastases. Surg Neurol Int. 2013. 4:S209-19. [Medline]. [Full Text]. Romanova AL, Nemeth AJ, Berman MD, Guth JC, Liotta EM, Naidech AM, et al. Magnetic resonance imaging versus computed tomography for identification and quantification of intraventricular hemorrhage. J Stroke Cerebrovasc Dis. 2014 Sep. 23(8):2036-40. [Medline]. [Full Text]. Schaafsma JD, Mikulis DJ, Mandell DM. Intracranial Vessel Wall MRI: An Emerging Technique With a Multitude of Uses. Top Magn Reson Imaging. 2016 Apr. 25 (2):41-7. [Medline]. Mandell DM, Mossa-Basha M, Qiao Y, Hess CP, Hui F, Matouk C, et al. Intracranial Vessel Wall MRI: Principles and Expert Consensus Recommendations of the American Society of Neuroradiology. AJNR Am J Neuroradiol. 2016 Jul 28. [Medline]. Mandell DM, Mossa-Basha M, Qiao Y, Hess CP, Hui F, Matouk C, et al. Intracranial Vessel Wall MRI: Principles and Expert Consensus Recommendations of the American Society of Neuroradiology. AJNR Am J Neuroradiol. 2017 Feb. 38 (2):218-229. [Medline]. Lehman VT, Brinjikji W, Mossa-Basha M, Lanzino G, Rabinstein AA, Kallmes DF, et al. Conventional and high-resolution vessel wall MRI of intracranial aneurysms: current concepts and new horizons. J Neurosurg. 2017 Jun 9. 1-13. [Medline]. Bradley WG Jr. MR appearance of hemorrhage in the brain. Radiology. 1993 Oct. 189(1):15-26. [Medline]. Ebisu T, Naruse S, Horikawa Y, Tanaka C, Higuchi T. Nonacute subdural hematoma: fundamental interpretation of MR images based on biochemical and in vitro MR analysis. Radiology. 1989 May. 171(2):449-53. [Medline]. Fobben ES, Grossman RI, Atlas SW, et al. MR characteristics of subdural hematomas and hygromas at 1.5 T. AJR Am J Roentgenol. 1989 Sep. 153(3):589-95. [Medline]. Linfante I, Llinas RH, Caplan LR, Warach S. MRI features of intracerebral hemorrhage within 2 hours from symptom onset. Stroke. 1999 Nov. 30(11):2263-7. [Medline]. [Full Text]. Ryan ME, Jaju A, Ciolino JD, Alden T. Rapid MRI evaluation of acute intracranial hemorrhage in pediatric head trauma. Neuroradiology. 2016 Aug. 58 (8):793-9. [Medline]. Abid KA, Sobowale OA, Parkes LM, Naish J, Parker GJM, du Plessis D, et al. Assessing Inflammation in Acute Intracerebral Hemorrhage with PK11195 PET and Dynamic Contrast-Enhanced MRI. J Neuroimaging. 2017 Oct 24. [Medline]. Hodel J, Aboukais R, Dutouquet B, Kalsoum E, Benadjaoud MA, Chechin D, et al. Double Inversion Recovery MR Sequence for the Detection of Subacute Subarachnoid Hemorrhage. AJNR Am J Neuroradiol. 2014 Sep 11. [Medline]. Patel MR, Edelman RR, Warach S. Detection of hyperacute primary intraparenchymal hemorrhage by magnetic resonance imaging. Stroke. 1996 Dec. 27(12):2321-4. [Medline]. [Full Text]. Satoh S, Kadoya S. Magnetic resonance imaging of subarachnoid hemorrhage. Neuroradiology. 1988. 30(5):361-6. [Medline]. Smith EE, Rosand J, Greenberg SM. Hemorrhagic stroke. Neuroimaging Clin N Am. 2005 May. 15(2):259-72, ix. [Medline]. Chakeres DW, Bryan RN. Acute subarachnoid hemorrhage: in vitro comparison of magnetic resonance and computed tomography. AJNR Am J Neuroradiol. 1986 Mar-Apr. 7(2):223-8. [Medline]. Whang JS, Kolber M, Powell DK, Libfeld E. Diffusion-weighted signal patterns of intracranial haemorrhage. Clin Radiol. 2015 Aug. 70 (8):909-16. [Medline]. Hodel J, Aboukais R, Dutouquet B, Kalsoum E, Benadjaoud MA, Chechin D, et al. Double inversion recovery MR sequence for the detection of subacute subarachnoid hemorrhage. AJNR Am J Neuroradiol. 2015 Feb. 36 (2):251-8. [Medline]. Oda S, Shimoda M, Hirayama A, Imai M, Komatsu F, Shigematsu H, et al. Retrospective review of previous minor leak before major subarachnoid hemorrhage diagnosed by MRI as a predictor of occurrence of symptomatic delayed cerebral ischemia. J Neurosurg. 2017 Feb 10. 1-7. [Medline]. Weimer JM, Jones SE, Frontera JA. Acute Cytotoxic and Vasogenic Edema after Subarachnoid Hemorrhage: A Quantitative MRI Study. AJNR Am J Neuroradiol. 2017 May. 38 (5):928-934. [Medline]. American Heart Association Stroke Council, Council on Cardiovascular and Stroke Nursing, Council on Clinical Cardiology. Guidelines for the Management of Spontaneous Intracerebral Hemorrhage: A Guideline for Healthcare Professionals From the American Heart Association/American Stroke Association. Stroke. 2015 Jul. 46 (7):2032-60. [Medline]. Wu Q, Li MH. A comparison of 4D time-resolved MRA with keyhole and 3D time-of-flight MRA at 3.0 T for the evaluation of cerebral aneurysms. BMC Neurol. 2012 Jul 6. 12:50. [Medline]. [Full Text]. Venous hemorrhagic infarcts in the bilateral frontal region. These appear as an isointense-to-hypointense signal on T1-weighted (T1W) MRIs and hypointense on T2-weighted (T2W) MRIs. Also seen is blooming on the gradient-echo (GRE) image with a rim of hyperintense vasogenic edema. 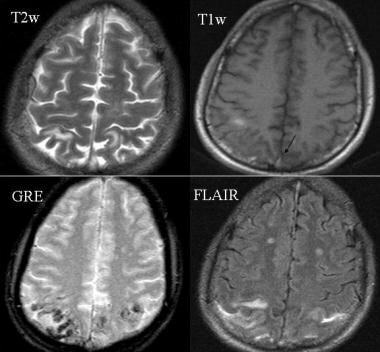 Venous angioma shows characteristic flow void on T2-weighted (T2W) MRI and mixed signal intensity on T1-weighted (T1W) MRI. Catheter angiography (DSA) shows the typical caput medusa appearance of the small parenchymal veins suggestive of a venous angioma. MR imaging shows an acute-to–early subacute hematoma within both lateral ventricles in a patient with adult-onset moyamoya disease. The blood in the ventricles appears as central isointensity with peripheral hyperintensity on T1W images as isointensity on T2W images, with blooming seen on gradient-echo (GRE) imaging. MR imaging shows hemorrhagic transformation of an infarct in the territory of the left middle cerebral artery. T1-weighted (T1W) MRI shows a wedge-shaped hypointense area with a few isointense and hyperintense areas within it. The lesion is predominantly hyperintense with a few hypointense and isointense areas on the T2-weighted (T2W) image. Marked blooming is seen on the gradient-echo (GRE) image, suggestive of hemorrhage. T2-weighted MRI shows rounded lesions that are centrally hypointense and peripherally hyperintense. An isointense lesion with peripheral edema is seen in the right basal ganglia. 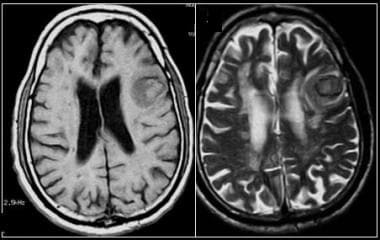 These lesions have central hyperintensity and peripheral hypointensity on T1-weighted MRI. All of these lesions show susceptibility on gradient-echo images, with minimal ring enhancement on gadolinium-enhanced images.